Where do I start with this majestic place? I visited the Amalfi coast for the past week so my impressions are ultra fresh. The Amalfi coast is a collection of towns/cities in southern Italy going from the Positano area to Salerno. 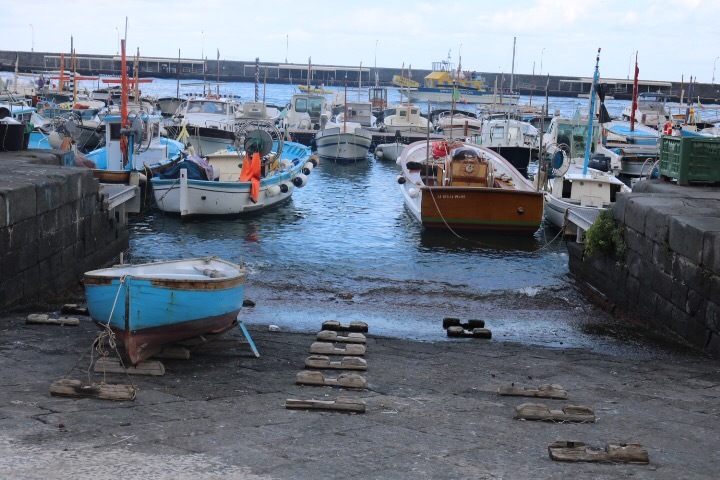 Sorrento is not technically part of the Amalfi coast and neither is Naples but Naples is an easy connection to the coast. The people of the Amalfi coast are some of the warmest and inclusive I have met in Europe. My husband and I stayed in Conca Dei Marini (more on that later), which is a small town. This meant we encountered a lot of people who spoke very little or no English. On our way from Naples to Conca Dei Marini, our taxi stopped at a small grocery so we could stock the house. By this point, I was looking for the bathroom. Well I asked for the “bathroom”…got nothing. Then toilettes (thinking hey, use your french and someone will understand). Ha, the daughter sent me downstairs thinking I meant toilet paper. Finally, I said “Bain”…another French attempt (although the bain in France is where the shower/tub is and separate from the toilets, so I was hoping I wouldn’t get a super awkward look), and bingo…mama and daughter laughed hysterically and showed me the bathroom. Point is, they were very gracious. Ya know, humanity. Don’t get me wrong, some folks (mainly dudes) were gruff but it wasn’t the norm. One of the hardest things about the Amalfi coast is deciding which town to stay in. Hard in the first world problem sense of course. The towns I visited were uniquely different, each with something to offer. Conca Dei Marini is where we stayed and rented a villa. It is east of Praiano, 7 kilometers west of Amalfi. 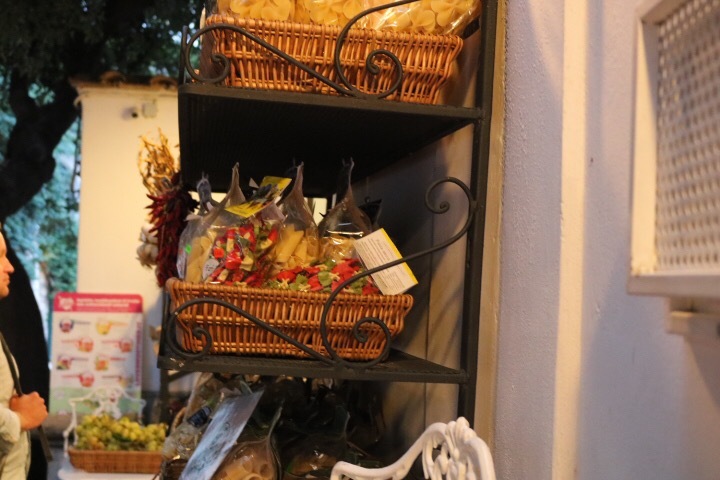 Conca Dei Marini is very small with a couple of restaurants: notably Euroconca and Le Bonta del Capo, and a small yet convenient gas station with snacks and wine. We stayed at Villa Bice (courtesy of SummerinItaly). Where Conca has Positano and Praiano beat by a long shot: proximity to the sea and views. Our villa overlooked the Tyrrhenian Sea and the steps led directly to the sea. People in the neighboring house were out in the sea everyday – it was really a sight. You will not get a view or direct access to the water like this in Positano. Not to mention this type of privacy. It is truly the type of private experience I imagined when booking something on the Amalfi coast. Positano is the largest town on the coast with the most shops, bars, and restaurants. 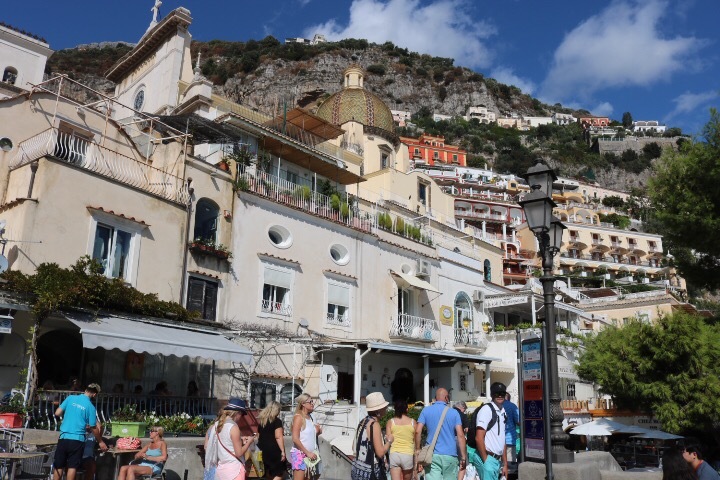 Praiano is smaller, slightly East of Positano but also has a good amount of shops and restaurants. Both are lovely but Positano is stunning. I loved it and would definitely stay there if I visited again. The colorful cliff side homes and plentiful shopping make this the perfect stay for people who want to walk everywhere from their hotel and have plenty of food and shopping options. One cannot go to the coast without going to Capri. It is one of the most amazing sites I have ever seen. Another beautiful cliff side town and it is reachable by ferry or a private boat – more on that later. 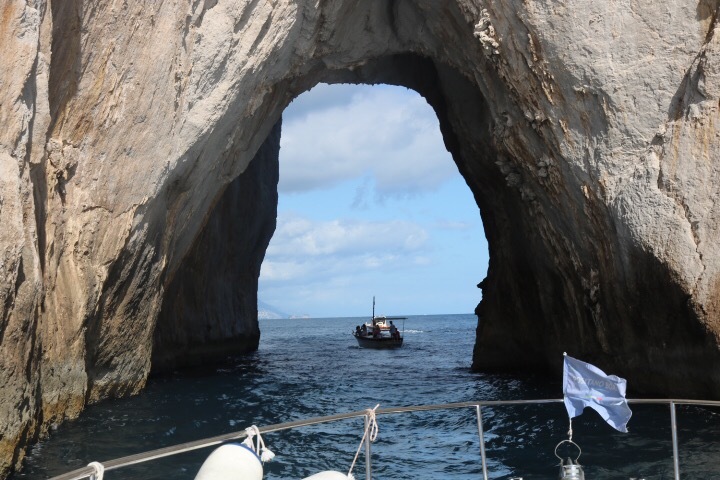 Capri is full of winding roads and beautiful views of the Gulf of Naples. It also ranges from unbeatable deals to over the top prices. At the bottom of Grand Marina, Capri just after docking, there are a couple of shoe stores that have really nice leather shoes (men’s and women’s) for around 50 euro. Everyone I was with ended up buying a pair. Then as you ascend the cliff, stores like Dior and Farragamo pop up. The island has something for everyone. We only stayed for a few hours but I’d highly recommend a full day in Capri or staying overnight as there’s so much to see and the crowds make it harder and longer to navigate. As we only had a few hours, we only had one meal. 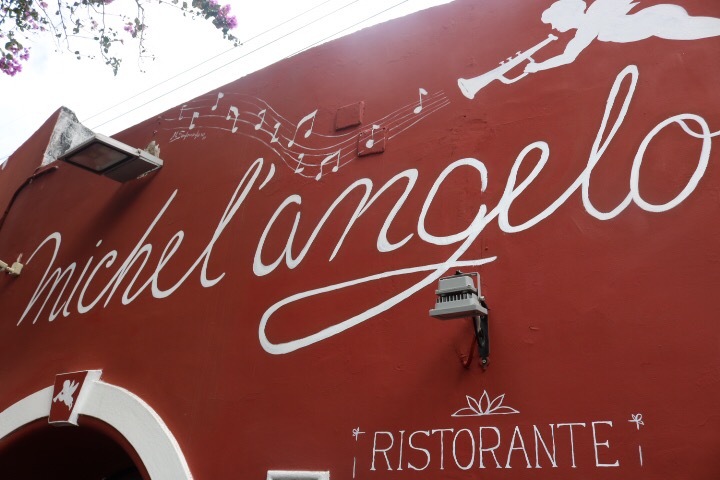 We headed to Michel’ Angelo, a restaurant that has five stars on Yelp, and a lot of people have been trying to get to for months. We luck out and get a table and the food is delicious. It’s heavy on seafood and pasta, all of which I want. The setting is also super cute – there are vines and hanging peppers and garlic, giving it a garden feel. The owner is also super nice. His wife works there too and we met his mother and daughter. When the daughter came in she started crying and whining (she’s two) and the owner gives her a whole diner role. The tears cease. Italians know the way to the heart. Eat all of the tomatoes. I guess the ones in the US are full of pesticides because not only do they taste flavorless, they also lack color. On the coast, the tomatoes are bright red and bursting with rich, tangy, and sweet flavors. 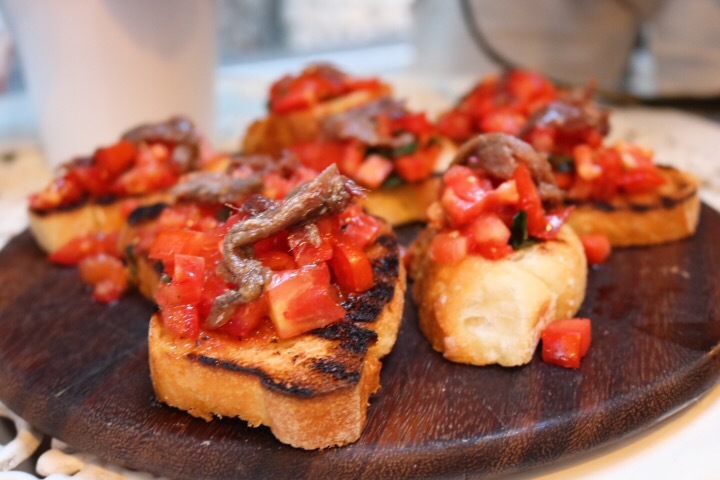 So you guessed it, it’s hard work but eat all of the bruschetta, red sauce, and pizza because they are going to be completely different and delicious. I love Italian lemons because they are super bright…and because the coast uses them for alcohol AND dessert. You have already heard of limoncello. 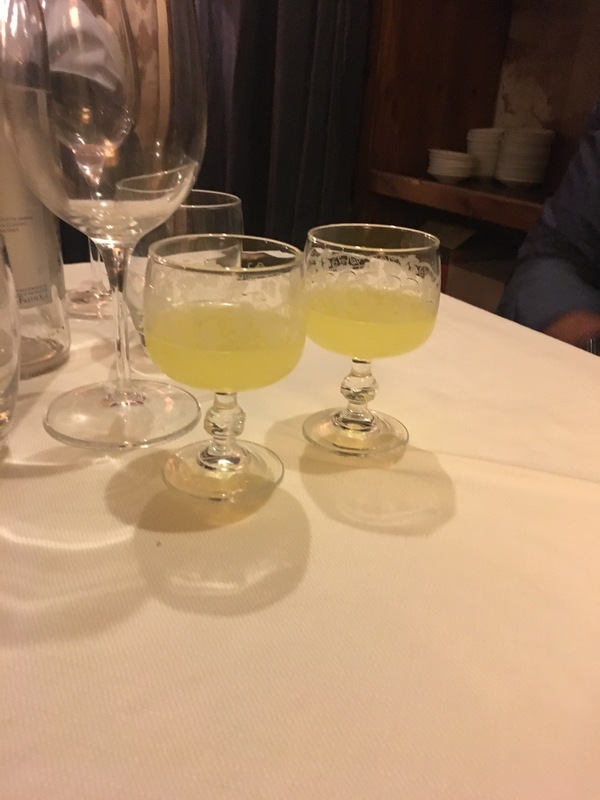 It’s used as a digestif or after dinner drink made of sugar, alcohol and lemons (surprise). There are two variations: Roman and Amalfi. Roman is the strongest with alcohol contents hovering between 30-40%. Amalfi coast lemoncellos are typically around 20-30% so it all depends on what kind of day you have planned. You should also try the Sfoglietella Santa Rosa. I typically don’t like lemon flavors desert because the lemon taste seems artificial. But, not these. 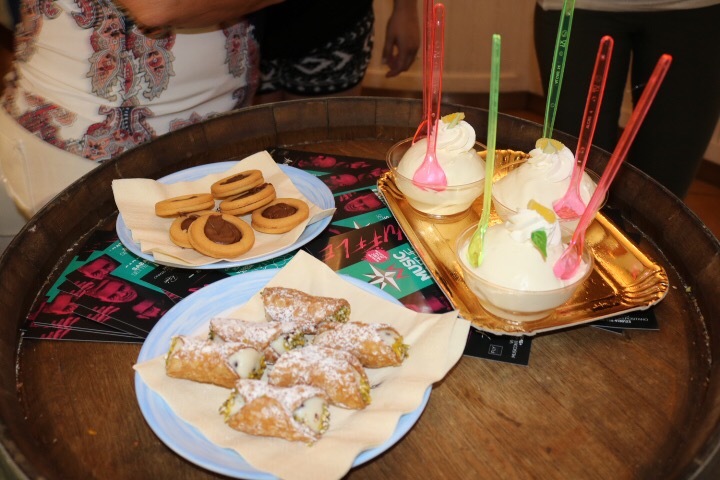 The shell shaped pastry and the lemon flavored filling has origins in a Conca Dei Marini monastery and is oh so yummy. Zucchini prepared in different ways are very popular on the coast. The most popular are zucchini flowers which is zucchini lightly battered, stuffed with meats or cheeses and fried. Quite enjoyable. 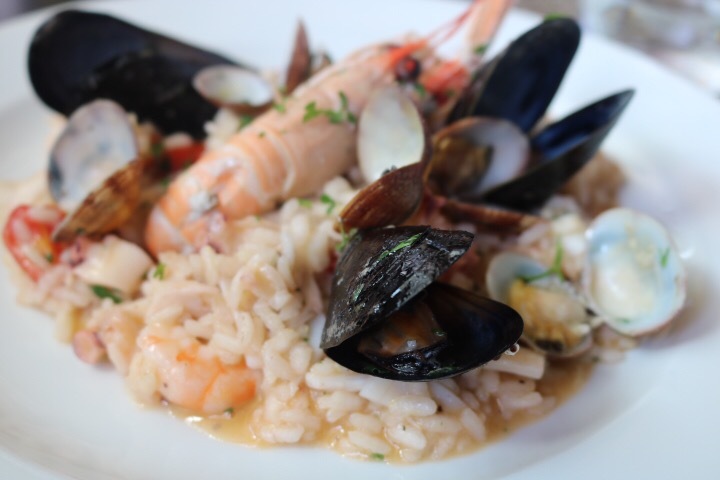 Have some fish, any fish but my favorite was Concetta – thick and meaty like swordfish. This is a popular local cocktail that not only tastes but also looks great. 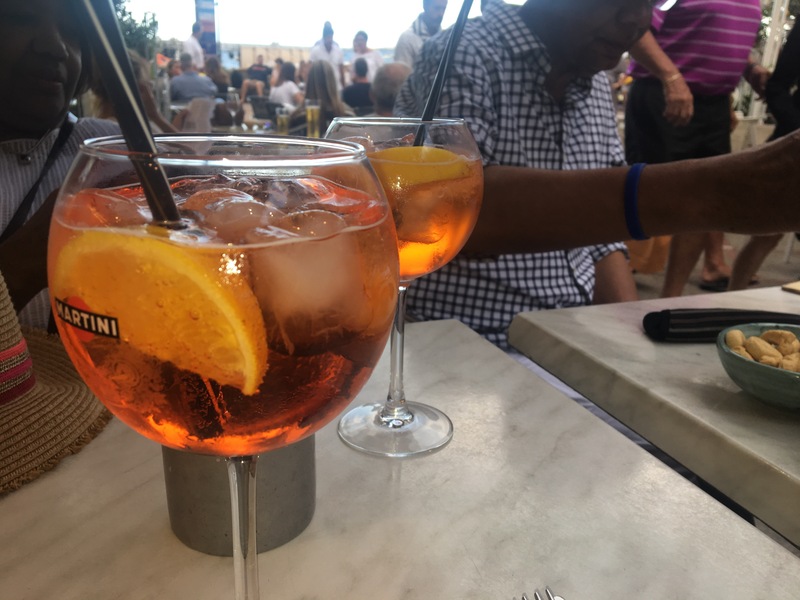 It has a light bright orange color from the Aperol and is mixed with prosecco and soda. Famous throughout Italy because ice cream is a great thing. Have some everywhere you go, you really can’t lose. Next2 restaurant – It’s touted a lot on various sites. Very nice views but very mediocre food with unfriendly hosts. I should have known this wouldn’t be very good. It’s too commercialized and the locals had mixed feelings about it saying the chefs keep changing. We had sea bass, shrimp, and seafood pasta. All looked beautiful but tasted ehhh. The sea bass was butchered…I mean filleted at the table. Still full of bones and badly mangled. Hmph, hard pass on revisiting this place. After you eat everything, walk the streets and check out the neat shops that are particular to the coast. 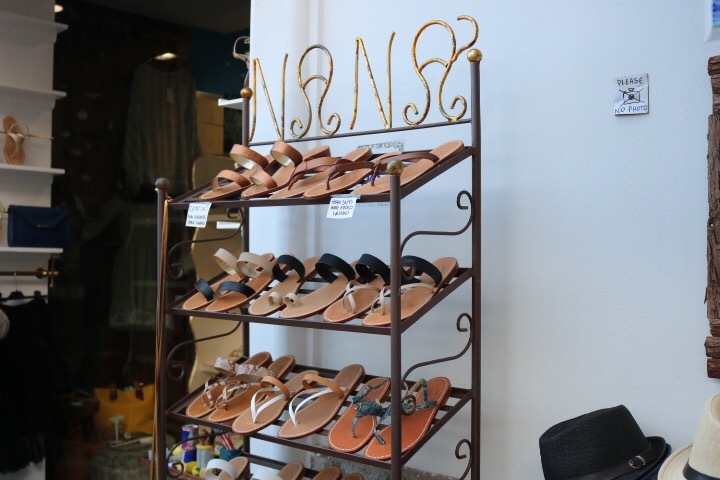 Amalfi is famous for handmade sandals, linens, and ceramics. 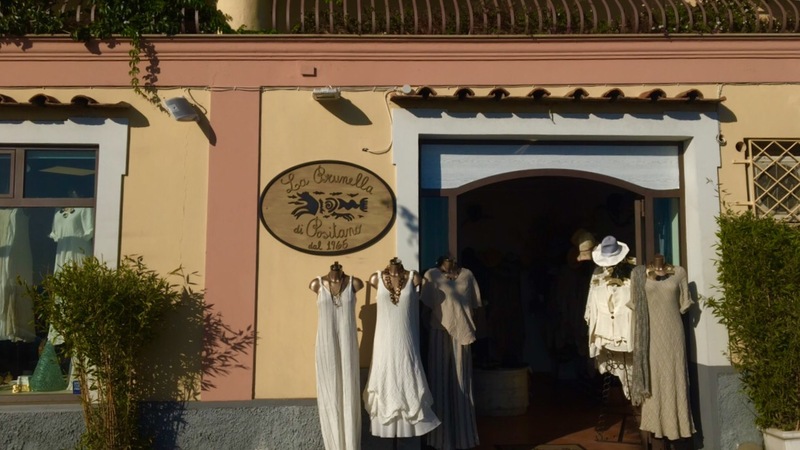 There is a store at the top of the Positano hill where the bus lets off called La Brunella. If you like linen, this is definitely worth a stop. Disclaimer: I don’t know what makes good linen but this is just different. The quality is amazing and the fabric is so soft and thick. Apparently the ceramic tradition was picked up from Jewish migrants in the mid 1900s. The ceramic items are all around the coast, particularly in Positano and Capri. They’re bright and really interesting. I didn’t pick any up because…space. But I found the pieces to be really unique, definitely not something I’d seen in the US. I loved Positano Boats. The company allows individuals to rent yachts of different sizes and either take a tour around the Amalfi coast or to Capri. We opted for the Crowne boat and a trip to Capri. I highly recommend this experience. Let me set this up. We get on the boat with Francesco, who is clearly part of the too live crew. “Hello! I live here,” he says with a sinister laugh as we see the beautiful cliffs of Positano on one side and the deep blue sea water on the other. OK Francesco. Next we head to Capri. It’s about an hour ride. The water is choppy (to us). Francesco doesn’t care. He’s a fisherman from way back and extremely at ease on the boat, showing us pictures of his children and wife (super cute) and cracking jokes. Meanwhile, my body has rejected the sea and I get Missy Elliot “Can’t Stand the Rain” levels of dizzy. Francesco is weirded out by feeble American bodies but tells me not to drink when we get off at Capri. We arrive in Capri. Whoa, quite a site. Colorful homes line the island, panoramic sea views (obviously), shops, restaurants everywhere. I get Dramamine from the drug store and life improves dramatically. After some light shopping and lunch, we head back to the boat. This is where things get interesting. 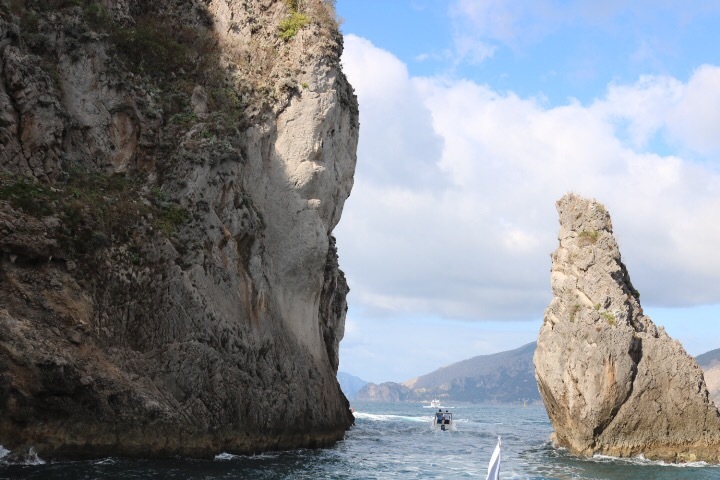 Francesco shows us Anacapri along while pointing out hotels on the peak of cliffs, statues that are nestled in cliffs and…the grottos. In my life I’ve never seen anything like these grottos. They are all caves that have been turned into works of art created by the sea and named for their colors. 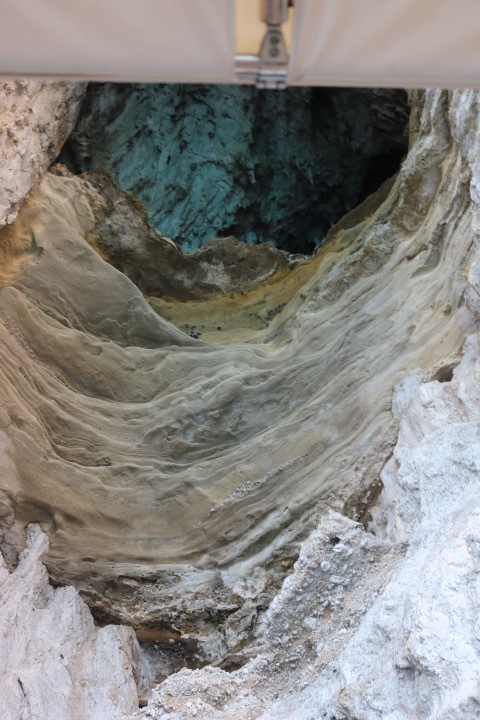 We saw the cave of birds, cave of love, the blue and green grotto. Then Francesco backs us into an uncrowned area of the sea and says, “who wants to swim?” My stepdad (who joined me with my mom for a couple of days in Amalfi) is a fish so he’s game. My husband quickly says yeah. And I’m sitting there looking like the friend who came to Italy and doesn’t want to eat Italian food. Francesco says, “you tell your friends, I go to Amalfi and get on the boat and no swim!” Coupled with a sinister laugh. OK Francesco. I get in and the water is super refreshing not to mention incredibly salty so I don’t have to do much work. The waves move me around and I oblige. 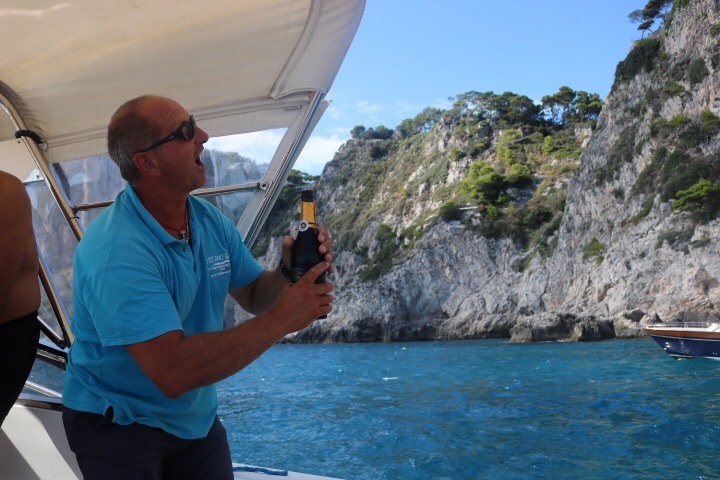 After we get back on the boat, Francesco pops the prosecco and blasts Motown, house music, and Italian opera. 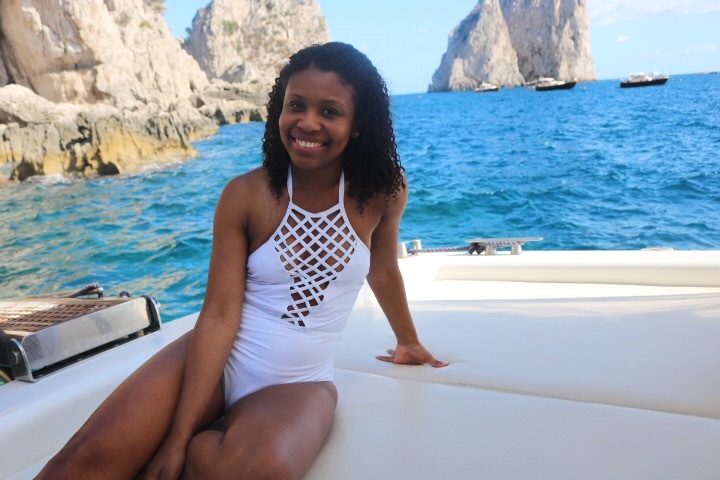 We laugh and sing through the white grotto and take pictures at the famous Capri spot. This was everything. I have to admit that some of my favorite restaurants (like La Latteria) were cribbed from Zia Lucy’s tour. 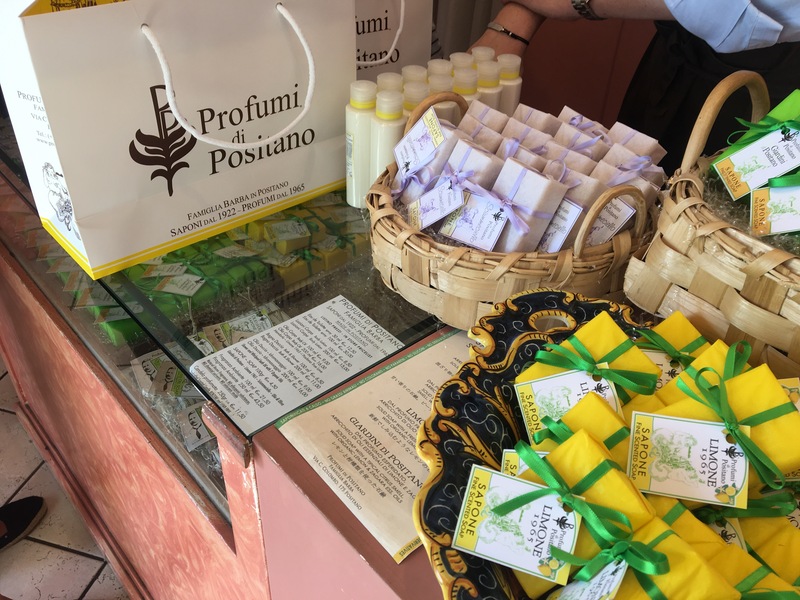 She is a Positano native and does wonderful walking tours throughout Positano that give you a literal and figurative taste of the city. 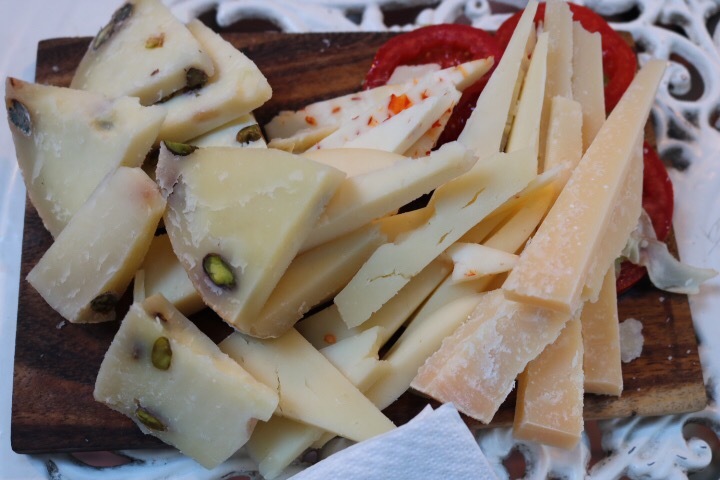 The name of the tour is a bit of a misnomer because while the bites are delicious, she also gives you the history of Positano as you descend the hills. I found Zia Lucy through TripAdvisor as she does a hiking tour but know that the food tour is not specifically listed. If you go to her website, you can request the tour. During the tour we found out that Zia Lucy is basically a local celebrity. Guys on motorcycles were blowing kisses as they buzzed by and giggling like school girls as they said hi to Zia Lucy. I see you Zia. Thirst in another language is still thirst. Zia Lucy took us to several restaurants for tasting which were smooth, with each place expecting our arrival and having a local item or items for us to try. 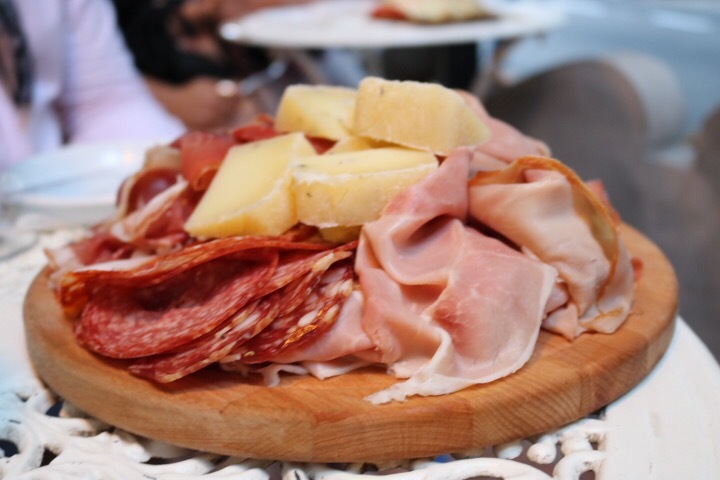 My favorite place we visited was La Latteria the best bruschetta and charcuterie of the whole trip. The best part was everyone who passed by was staring at the mounds of meat and cheese and whispering, “how do they get that?” I’ve never felt exclusive with a TripAdvisor tour but I like. I can’t recommend this tour enough, it’s a great way to meet other travelers and learn the city from a local. You should know that it is possible to visit multiple towns during your stay on the Amalfi coast. You can either take the bus or a cab. On the coast, cabs must be prearranged, which is a little annoying and expensive. If you’re used to Uber, it’s a bit combursome setting up a cab for a week in advance. 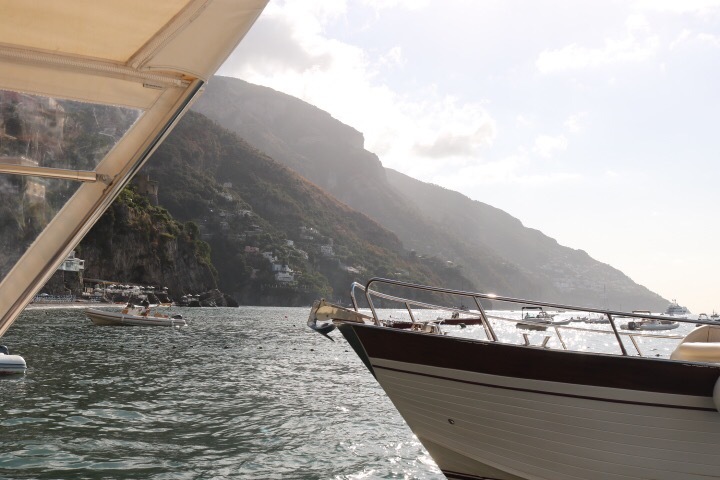 And the cost from Conca dei Marini to Positano was anywhere from 60-70 euro each way. Going to Amalfi was 30-50 euro each way. But it’s an option. You’re going to need some fashionable sneakers or comfortable FLAT espadrilles. The cliff is not for the faint of heart so don’t try to be cute. If you do, don’t say I didn’t warn you. Also, wear layers. The temperature is very dependent on the sun so it can go from a super hot summer day to a cool fall night. And add about ten degrees to the weather forecast. Before we left, the highs were 75 each day which I consider somewhat cool. Wrong. The sun will make it feel a good 85 so pack accordingly. This trip sounds tantalizing and breathless! It was definitely one of my favorites places. Is it on your bucket list? That would be an awesome birthday!! I’m sitting on my front porch dipping some fresh bread in some awesome olive oil just back from the Amalfi coast!!!! Thanks Camille ! Hope to go back to Italy in a year or so, thanks for the great tips. So glad you’re loving the olive oil (we are too :)). It’s from La Latteria – definitely worth a visit when you go back.